Situated alongside the Alster Lake in the trendy enclave of St. Georg, Le Meridien Hamburg offers a chic urban experience. The hotel is within easy reach of Hamburg’s historic quarters, the city center, trade fair grounds, the harbour, and the UNESCO world heritage sites Speicherstadt and Kontorhausviertel. The 275 elegant rooms and suites envelop guests in comfort with exclusive furnishings and upscale amenities. 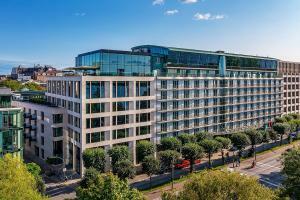 Located in Hamburg, Germany, just a few minutes away from the city center, trade fair grounds, and the harbour. Musical Dome, Golf Club Gut Kaden, Historic City Hall, Model Railroad Complex Miniatur Wunderland, Hamburg Harbour, Shopping District.